Whether you are a bow hunter or a competition shooter, bow sight is one of the most important accessories you shouldn’t ignore. Though there are bows that come with a sight, most users prefer buying one on their own. If you are one such person, you could often find it confusing when it comes to choosing the best bow sight, mainly with so many models available in the market. We would like to simplify the process for you by providing all the information you need to know about choosing the best bow sight and reviewing some of the best models available today. Bow sights are of different types and each one has advantages of its own. The most commonly used types are the fixed pin sights, which are known to be the most reliable and easily adjustable option as well. Fixed pin sights are the preferred choice among bow hunters because of the fact that they will not have to make any adjustments while hunting. In addition, you will also be able to find moveable pin sights that are designed specifically for distance shooting. Pendulum sights are another type that is designed to help hunters fire at any vertical angle. If you are looking for a bow sight to make precision shots in target practice or competitions, you need to choose one that is designed specifically for these purposes and not the ones used for hunting. Competition sights are quite similar to movable pin sights, except that these come with advanced options for windage and elevation adjustments. These sights always deliver excellent accuracy and can be paired with laser lights and scope points as well. Number of pins: The amount of pins to have on your bow sight can be determined by different factors. The basic factors include your shooting location and your shot opportunity types. Some users prefer using a single pin, and then aim below or above that pin based on the distance of the target. On the other hand, there are also users who choose to have even six pins, making sure that they aim directly at a pin for a 5 or 10 yard increment. Low light visibility: If you happen to hunt in low light conditions more often, you should consider buying a bow sight with this feature. Some bow sights are illuminated based on the material they are made of, like fiber optic. However, there are also battery powered ones that perform the job equally well. Easy adjustment capabilities: A good bow sight should make windage and elevation adjustments easy for the user. Therefore, look for sights that are known for their easier fine tuning capability. Gang adjustment: If you find yourself in conditions where you are required to make frequent elevation and wind adjustments, you might want to look at bow sights that come with the gang adjustment feature. With this feature, you can easily adjust all the pins simultaneously, without having to make changes individually. If you are an expert target shooter looking for an awesome competition bow sight, you will have to spend over $500. On the other hand, if you are just starting out or an intermediate shooter, you will be able to find sights starting from as low as $20. As you learn new techniques, you can keep upgrading your purchase. Field Logic is a pioneer when it comes to providing sights for compound bows. Accuracy and ease of use are two of the major advantages of the products from the company. Expert archers and hunters will know how complex it is to handle a bow. The sights from the brand make it easy for you and give you ample time and confidence to aim and shoot at the target with precision. IQ 5 Pin Sight is another exciting product from Field Logic and this sight lets you aim and shoot at the target at flashing time with accuracy. Bow consistency can be achieved with the help of this product. Let us discuss more about this product in detail. Before we start discussing further about the product, we have to tell you that IQ 5 Pin sight is by far the best fixed pin sights in the market. Compound sight technology incorporated in this product is a trademark, which means you get to improve your sight accuracy and consistency. Retinal lock technology is very helpful in assisting you to aim at your target with precision. Feedback on form, consistency and muscle movements will be given, which will help you make the adjustments necessary to improve your aim. Target aiming at close and long distances can be enhanced without any faults. IQ 5 pin sight is designed to suit a right hand archer or shooter. Accuracy and consistency of your shooting will improve drastically by using this sight. It is very easy to mount this sight on your compound bow and it allows you to adjust even the 2nd axis as well. Accurate groupings are one of the main advantages delivered by this sight. Hunters, shooters, archers etc. will not have to buy peep to enhance your target aiming anymore. 5 pin sights give you the opportunity to adjust and aim at your target both vertically and horizontally. You can use these 5 pins to either hit the target at close distances of 10 yards or long distances on a consistent and continuous basis. IQ bright dot lets you aim at your target with accuracy and night target aiming is enhanced by this product. Fiber optics that is included in the sight will benefit all the hunters who love shooting at night or low or transitional light conditions. The 5 IQ sight pins are 0.019 fiber optic pins; they glow in different colors and provide excellent aiming even at night. Every pin delivers a unique color and this will avoid confusion when you have multiple targets. The fact that this sight is designed specifically for right hand shooters is kind of disappointing because there are a lot of left hand shooters looking for a sight that delivers maximum precision. If you love uphill shooting, then there is a 2nd axis adjustment providing you with the accuracy you need. IQ 5 pin sight from Field Logic is the number one choice for pro hunters, shooters and archers. IQ 5 Pin Sight technology is trademarked and this ensures maximum accuracy. This will give you the confidence to shoot at your target all day long. Fiber optic technology included in this sight is very useful. Manufacturer warranty and money back guarantee are standard. Some users have complained about the occurrence of cracks on the sight casing. Designed specifically for right hand shooters. Trophy Ridge is one of the leading manufacturers of sights, rests, quivers and stabilizers. Accuracy, precision, control and all the necessary tools needed to improve accuracy are manufactured by this company. They are focused on providing multiple products, each delivering high quality and precision. Here we will discuss about the Punisher 5 sight offered by the company and is one of the favorite sights for many leading shooters. Let us take a deeper look into this product. A sight is a very important accessory and it makes or breaks a perfect shot. If the sight we have is not up to par then we will end up shooting all over the place. Punisher sight is one of those perfect sight gears for shooters. Hunters can shoot at their target on a consistent basis day in and day out with this product. It comes with 5 pins and every single one of them is adjustable. These pins can be adjusted or replaced based on your requirements. There is no need for any other tool to replace or adjust them, making them one of the convenient pins to operate. Trophy Ridge punisher is designed to suit all the different shooting styles. Both right and left hand shooters will find this sight effective. Some hunters may target in a straight on fashion whereas others might have a lean angle shooting style. Punisher sight perfectly suits all kinds of shooting styles. Simply adjust the pins to suit your shooting style and enjoy hunting. Sight mounting is very simple with this product because there is no need for any special tool to mount it in place. A level is all you would need to mount it right away. Pins are designed in such a manner that they suit all kinds of shooting scenarios. Uphill hunting, downhill shooting, tree stand and many more shooting combinations can be achieved with accuracy with this sight. Punisher comes with fiber optics pin, which means you have the precision to shoot at your targets even at low light conditions. Shooting at transitional light conditions is definitely challenging, but this product will make sure that you shoot at your target spot on even at night. Trophy Ridge punisher does not come with sight light, which is the only visible drawback of the product. You can certainly buy the light by paying an additional fee. Punisher is one of the high quality, durable and reliable sights which is also affordable. Customizable features to suit different shooting styles also make it a preferred choice for all kinds of shooters. The ability to adjust or replace pins even on the field is quite remarkable. Suits all shooting styles. Extremely convenient. Elegant easy to mount design. Designed for both left and right hand hunters. Trophy ridge punisher 5 sight doesn’t come with sight light, which is kind of disappointing. Lack of sight light prevents it being helpful in all light conditions. You can add sight light for an extra fee. TruGlo have been one of the leading manufacturers for gears catering to the needs of all tactical hunters. An extensive line of products for archery, crossbows, firearms, optics and all kinds of accessories for pro and amateur shooters is offered by them. Carbon XS is a trademark sight gear for archers. Amateurs and compound bow users looking for the best sight should definitely choose this. Carbon XS 4-pin sight weighs just around 3.5 ounces, which means you will not feel this sight mounted on your bow. It is very easy to mount this gear on to your bow. Carbon construction of this product makes it one of the lightest models out there. Protective coating and a camouflage design makes it perfectly suitable for all kinds of outdoor environments. The sights are manually adjustable and are designed to suit both left and right hand shooters. The pins and the sight can be adjusted both vertically and horizontally. There are two vertical bars which make mounting and adjusting a breeze. Making adjustments on the field is very easy, which makes it one of the best sights. Reversible bracket is also provided, which acts as a perfect adjusting tool. Pro shooters can make adjustments for all kinds of shooting styles and adventures they want. All the 4 pins are adjustable and they give a wide fielding view. Hunters will be able to keep track of their prey in their area quite effectively and aim at their target with precision. Shooter’s ring is also part of the product and it even glows in the dark. This ring can be aligned with your peep sight for more accurate shooting. Just like many other sights, even Carbon XS comes with fiber optic pins which glow at night. Low or no light shooting is possible with precision because of these pins. In order to eliminate blind target shooting, there is a push button light that comes with the sight. You can light it to fix your target before aiming, which gives you more control and confidence when taking your shot. TruGlo Carbon XS helps you deliver consistent shooting performance on both long and short range shooting. Superior performance is guaranteed by this product. Bow hunters will find this sight extremely useful mainly for its glow ring and fiber optic pins. Micro sight adjustments are not offered and therefore, you only get to make manual adjustments, which is one of its drawbacks. There are many complaints floating around about the compromised accuracy, which kind of creates doubts in the minds of pro shooters. Keeping all those factors aside, we have to tell you that TruGlo Carbon XS is one of the most popular sight gears for bow hunters all over the world. Affordable, durable and accuracy are the key success factors of this product. Few shooters complaint about compromised accuracy when aimed at targets in the range of 40 yards or more. Accuracy flaws create doubts in the minds of pro hunters. Apex Gear is a pure performance driven gear manufacturer for archers, shooters and hunters. Their product lineup is really staggering and there are gears offered for all kinds of shooters. Beginners, pro and tactical shooters will find the product they are looking for, from this brand. 1 dot pro sight from Apex Gear is an exclusive product not just for pro shooters, but also for every single person who simply loves shooting. We shall understand more about the product in detail below. Bow sight is one of the most vital accessories for shooters and this enhances security and accuracy leaps and bounds. 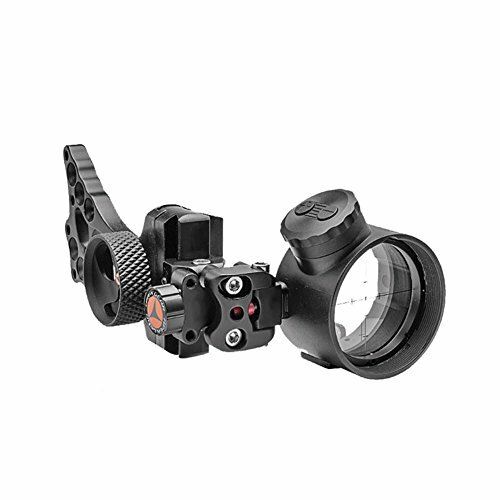 1 dot covert pro sight is an exciting product that lets you aim and strike with precision. This product is one of the most advanced 1 dot covert sights in the market right now. Aluminum lightweight body makes it perfect for the long haul. Gravity line technology incorporated in this sight ensures précised pin alignment. You can feel this difference as soon as you mount it and shoot. PWR dot technology helps in adjusting the green dot LED illumination between 11 different brightness settings. This enhances long distance shooting performance, which is very essential for bow hunters. Aperture housing in this product lets you make both vertical and horizontal adjustments in no time. Fine tuning of your shooting conditions can be done within seconds. Yardage indicator pin is set at the rear which makes it easily adjustable for the shooter. Another good news for archers is that this sight is designed to suit different shooting styles of both left and right hand archers. Sight pin color can be changed in seconds; there are three color options, which are red, green and yellow. Micro adjustable windage and the single handed adjusting capability are well received by many pro shooters. With the 60 pre-marked yardage tapes you could easily understand the flight characteristics of your arrow. One minor flaw with this product is that it is not very user friendly for shooters with big hands. Small wrench and smaller dovetail slide set screws make it a challenging affair for shooters. Multiple adjustable features such as 2nd axis, 3rd axis, windage, elevation change, bubble levels and many more make it one of the most exciting sight gears in the market. Superior quality and performance is guaranteed. Adjustable indicator pin for multiple shooting options. Pro dot aiming point is very bright and accurate. Rotational adjustment is gravity aligned and this enhances accuracy and shooting performance. Yardage tape adjustment is placed at the rear and this enables quick and easy adjustments for the hunter. 2nd and 3rd axis adjustments are available and this makes it one of the best products for both left and right hand shooters. Dovetail slide screws are small and those with big hands will generally find this difficult to operate. A small wrench comes with this sight, which is also tedious to operate. HHA is a brand you would mostly associate single pin sights with and there are many exciting products on offer from the brand. Optimizer sight series is one of the popular sights on offer. HHA has been providing high quality sights and gears for bow hunters for more than 30 years and they have achieved a reputation for offering high quality products. Most of the pro and hunting enthusiasts reading through this article will definitely know about the HHA sports brand. Optimizer Lite is another exciting sight gear offered by the brand and let us discuss about the same in detail further. OL 5519 Optimizer Lite is exclusively designed for bow hunters and pro shooters who just love to shoot at their targets at any given time. This is a single pin sight, which means you need very little time to make adjustments. No additional tools are needed to make adjustments to the yardage. Consistent and accurate target shooting for a distance of 80 yards is made possible seamlessly. Yardage increments are so precise, letting you shoot multiple targets. Optimizer Lite OL 5519 is black in color and this makes it blend in with any type of bow. Hunters love the color black, which also makes it one of the attractive sight gears. A protected fiber optic hood in the sight makes it easily adjustable for different light settings. Hunters simply love shooting at transitional light conditions. Rheostat light settings let you adjust the brightness of the pin light. 5 feet fiber cable also provides enough movement flexibility. Using a sight that is robust and durable is very important for a bow hunter. Optimizer Lite is designed to tackle all kinds of weather conditions. The product is rigid and at the same time super lightweight, which is also another huge advantage. Installation and adjustments are even which make it one of the most user friendly sights. Yardage sticker of this product lets you make simple and quick adjustments, which will then let you shoot across different distances automatically with accuracy and precision. Pro shooters will be able to see the difference in their target aiming easily. Hunting at low light or transitional light conditions is very challenging, but with this product, you get to shoot accurately and safely. Easy installation, durability and affordability are some of the strong points of Optimizer Lite. One slight drawback of the Optimizer Lite OL 5519 is its manual adjustments. It is time consuming to make manual adjustments, especially when you are on the field shooting multiple targets. Setting apart that slight flaw, many bow hunters rate this as one of the best single pin sights in the market. Pins can be set to deliver superior precision and accuracy. Perfect for shooting at low or transitional light conditions. Rigid construction with easy mounting capabilities. Any yardage adjustments should be made manually, which might be frustrating especially when you are on the field. Manual adjustments take up considerable time compromising accuracy, which is not good. Single pin bow sights are known for their simplicity, and users love them because of their easy-to-make adjustments. And it is this ease of use that translates to great accuracy, because all it needs is a few shots to become automatically proficient with the adjustments. In addition, single pin sights enable faster target acquisition, provide greater field of view, and also a clear sight picture. Many users may find the use of single pin sights a little intimidating initially; however, with just a simple demonstration and some learning, it will be one of the easiest sights you will ever use. 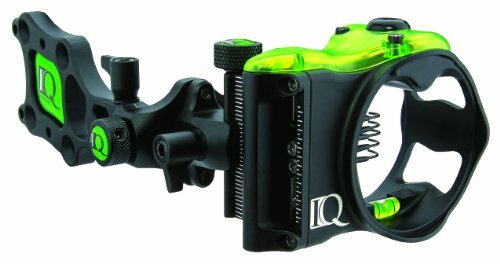 The React One 1 Pin Bow Sight from Trophy Ridge is one of the most popular lines from the company. 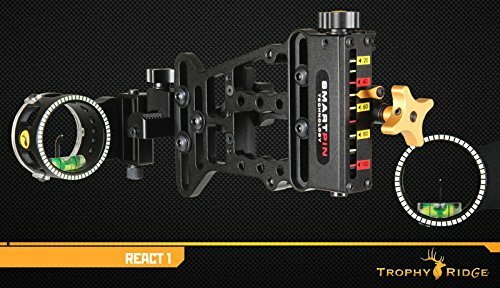 Equipped with a unique technology, which the company calls React Technology, this sight is designed to precisely predict each pin gap taking into account the distance between your 20 yard pin and other yardage. As a result, you will experience increased accuracy during each shot and you can also change the yardage easily to match your needs with the simple adjustment of a pin. If you already have some experience using bow sight, setting up and using this product will be a breeze. However, if you are completely new to the accessory, or new to using a bow in general, you will have to spend some time getting used to it before being able to make adjustments effortlessly. The sight comes with yardage stickers for 20 to 100 yards, so you can measure and calculate the right yardage distance, which will further guide you during hunting. Made fully of aluminum, the Trophy Ridge 1 pin bow sight is strong as well as flexible. The fiber optic pins make the sight visible even in low lighting conditions. Furthermore, the sight also comes with a sight light, which enables you to adjust the brightness and the level of intensity of the light, thus providing you with great visibility when you choose to go hunting late in the evening. To make the product more versatile, the company has designed it with numerous mounting holes, offering you the ability to change the position of your bow and use any of those holes based on your preference. If there could be one downside to the product, it would be that this model is quite big and heavy; therefore, it may not be the ideal choice for everyone and also makes transportation a little difficult. However, despite its size and weight, the Trophy Ridge React-One 1 Pin Bow Sight performs excellently well and will last long, thanks to its sturdy aluminum construction. Fiber optic pins for low light visibility. Quite a heavy sight, which makes transportation difficult. Manufacturer instructions could be better. 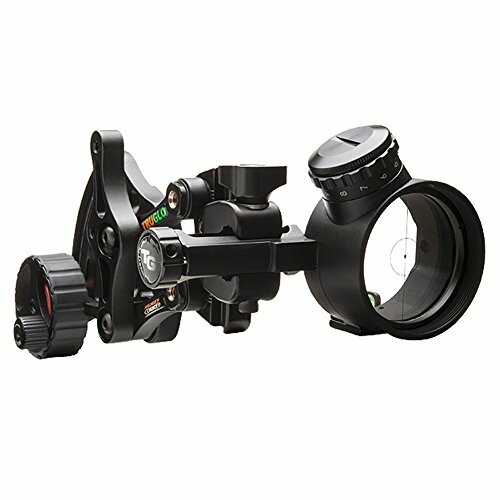 If you are looking for a single pin bow sight that is capable of helping you hit targets at longer distances and also giving you great visibility through the sight, the Archers Choice Range Rover Pro single pin bow sight from TruGlo should be your choice. The clear picture quality offered by this sight is at a level that cannot be easily defeated. TruGlo has always been known for its excellence in providing great visibility and brightness. When it comes to this product, you will certainly not be disappointed, because it comes with 11 different brightness settings on the adjustable green LED. The two technologies used by this single pin bow sight are Zero-In technology and PWR-DOT Illuminated CENTER-DOT Technology. While the former technology helps zero in your accuracy with the company’s Zero-In Adjustment Dial, the latter helps sharpen your long distance accuracy, which can be achieved with the lighted center dot on the scope housing. Installation of the sight followed by zeroing in can be completed within a matter of minutes, giving you more time to concentrate on the important task. The Range Rover Pro bow sight comes with 40 pre-marked yardage tapes to make it easier for you to setup with the right labeling. Ease of use is further improved by the laser marks indicating the elevation and windage settings. The sight can also be easily adjusted for left and right hand use. However, be sure to specify the type of bracket you want – left or right handed – while making the purchase to make sure that the right one is included in the package. In addition to the already bright LED dot, you also get a glow-in-the-dark shooter’s ring, which further improves visibility in low light. A CR2032 battery that comes with the device is used to power the LED, which is known to have a battery life of 700 hours. You can easily adjust the brightness level using the top dial, and the sight itself can be adjusted on a slider and tweaked to your liking. Due to its excellent versatility, the TruGlo Archers Choice Range Rover Pro single pin sight, it can be used not just for hunting, but also for target practice and 3D archery. 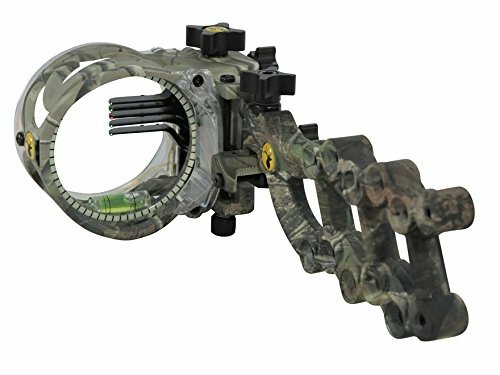 Apart from the fact that this particular single pin bow sight from TruGlo is a bit pricey when compared to the various fiber optic models on the market, it is an outstanding sight with amazingly working technologies. The high level of accuracy, wide range of brightness settings, clear visibility in low light, generous number of yardage tapes, micro adjustments, and more such features give you the confidence to make perfect shots every single time, and together make the product a reliable package. Micro elevation and windage adjustments. Suitable for left and right hand use. A bit highly priced when compared to fiber optic sights. Multi-pin sights, the category in which 5 pin bow sights belong, have been around for a long time now. Though the various bow sight models available today are hugely in advance of the older designs, especially in terms of their advanced fiber optics and lightweight structure, their basic principle is still the same, and the sights are designed to achieve the same precisely. As the name suggests, a 5 pin sight will consist of five adjustable pins placed within a circular housing. You can set each of those pins to a particular distance. In general, the top pin will be set for 20 yards, the next for 30 yards, and so on. When it comes to 5 pin bow sights, perhaps the most popular and best option would be the Field Logic IQ 5 Pin Sight. As we have reviewed this product earlier in the article, let us now move on to what we recommend next. 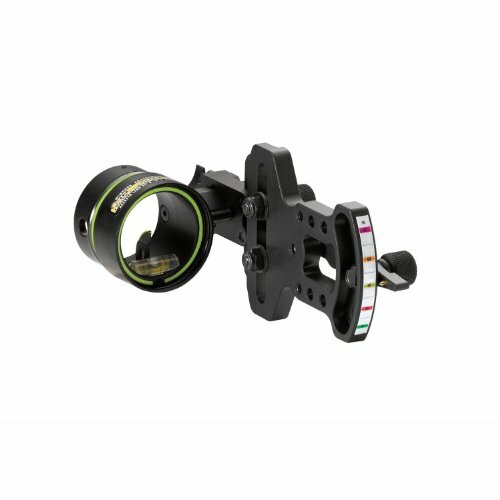 Looking for an extremely accurate, easy to calibrate bow sight that gives you the confidence to make long distance shots and also moderately priced? Take a look at the Trophy Ridge React 5 Pin Bow Sight. This particular bow sight model is designed to fit novice, intermediate as well as seasoned users, and is an excellent choice if you don’t want to spend a lot of money for a reliable and durable 5 pin bow sight. 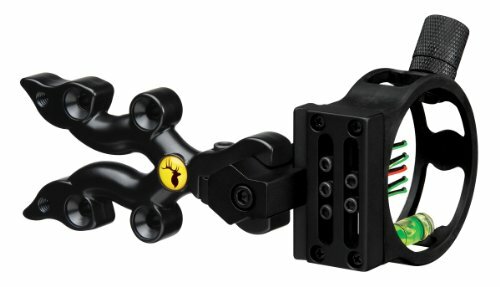 The React 5 Pin Bow Sight from Trophy Ridge is available for both right and left handed shooters. However, this cannot be done by just switching to a different mode, but you will have to buy the appropriate version of the product. One excellent feature of this product is the 100% tool-less micro-adjustment. This feature makes calibration easy; all you need to do is calibrate the first and second pins to 20 and 30 yards respectively and the remaining pins (for longer distances) will be calibrated automatically. You are also allowed to make minor adjustments to the calibration manually, if needed. This feature is definitely a huge deal for users because it basically saves you a lot of time by eliminating the need to keep shooting arrows to sight in pins for longer distances.